A week ago the 2015 AHR Expo kicked off at McCormick Place in Chicago. Not only were there 8% more exhibitors than last year's expo, but an extensive number of new HVACR products and technologies were featured at various booths. 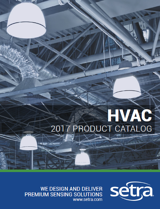 Setra was among these companies using the AHR Expo as a platform to launch the latest products in HVACR. With the recent outbreak of Ebola this past year, the healthcare industry has been looking to upgrade facilities with the latest technology. 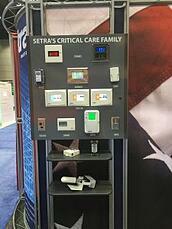 Among many other devices that control air flow and pressure in variouis patient room settings, Setra's SRIM2 made it's first expo appearance. The SRIM2 was developed to fill an unmet need in our critical care room pressure monitoring family. The SRIM2 is built off the platform of the original (SRIM1), but has added key features such as multiparameter alarming, velocity measurements, and added inputs and outputs to it's design. It is the most featured differential pressure product Setra manufactures without BACnet communications. Among the educational sessions at AHR, evolving European chemical and environmental regulations was a topic of discussion amongst attendees. Accuracy and reliability are critical factors in devices that certify processes in heavily regulated industries. Setra's MicroCal, one of the new products featured at the expo, is designed for use in critical environments that require portability, high accuracy, and periodic low pressure sensor calibration and documentation to certify regulated processes. Designed to perform calibration checks on installed pressure transducers, pressure switches, and gauges, the MicroCal offers users selectable automated pressure generation profiles with up to 101 calibration points. Attendees at the AHR Expo were extremely interested in devices that could provide them with the flexibility of changing configurations when needed. The Model MRC is Setra's newest differential pressure transducer, and the first multi-range transducer ever designed for use in Critical Environments. Contractors have been waiting a long time to use multi-range products in lab, hospitals, vivarium, pharmaceutical and other critical applications. However, the questionable performance at low ranges has prevented the use of multi-range products in these applications. The Model MRG is Setra's newest differential pressure transducer. The Setra MRG is the ideal product for any contractor to stock in their truck; combining the flexibility of a multi-range with the performance of a single-range transducer to ensure that you have the right solution for any job. Setra has taken data from over 30 years of transducer sales and designed the Model MRG to be able to satisfy over 90% of the range output configuration combinations. Energy efficient alternatives popped up all over the expo floor, especially those that can provide real-time data to consumers. Setra's Power Patrol allows consumers to access energy data as it happens, unlike submeters. This isn't the first time Setra's Power Patrol has been seen at the AHR Expo. Last year at AHR, before it's launch, the Power Patrol was the latest addition to Setra's wide array of sensing solutions. The SPP is every electrical contractor's dream. The Revenue Grade networked 3-phase power meter works with Rogowski Coils. The Power Patrol has a small enough form factor to be mounted inside or outside of the panel using either mounting tabs or the DINrail clip making it the easiest installation in the industry. CLICK HERE to read about Setra's newest solutions featured at the 2015 AHR Expo.